Pioneering San Diego-based Queer artist and photographer Robert Miles Parker also founded Save Our Heritage Organization (SOHO), dedicated to preserving San Diego's historic buildings and parks against redevelopment and gentrification. His recent passing in New York, where he had relocated, was memorialized by SOHO. A media release from Save Our Heritage Organization based on an interview Parker did with Jarmusch and Soderberg in 2009. 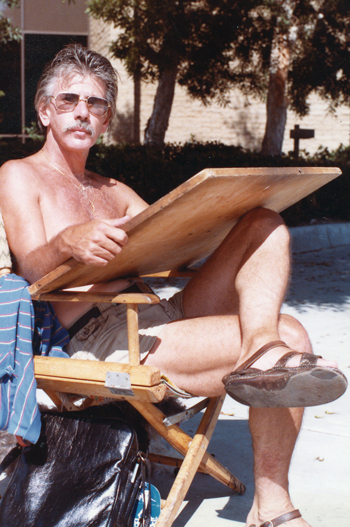 PHOTO: Robert Miles Parker in the 1980’s: self-portrait, courtesy Save Our Heritage Organization. Miles was a colorful, charismatic, and outspoken man. A renowned artist, his drawings have been published in magazines and newspapers such as San Diego Magazine, Sacramento Magazine and the New York Times, and collected in the books Images of American Architecture (1982), L.A. (1984), and Upper West Side: New York (1988). His work garnered him national attention, including two appearances on the Today Show with Barbara Walters. Additionally, he taught art at both Adult Night School and at College level. Rest in peace, Miles. We’re proud to carry on the battle for you, the battle you so passionately fought. You inspired us all.